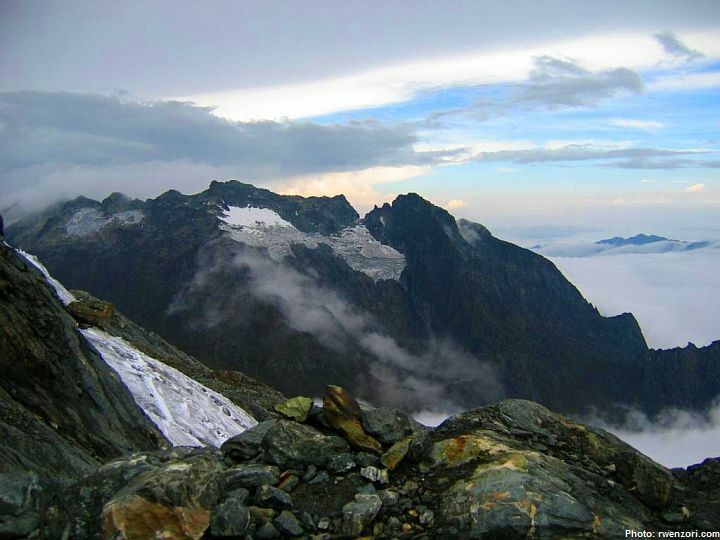 The Rwenzori (formerly spelled Ruwenzori) is a spectacular mountain range located in Africa on the border of Uganda and the Democratic Republic of the Congo. The range is not volcanic but consists of crystalline rock that moved upward from the earth's crust. Ancient people called the range "the Mountains of the Moon." Ptolemy, the Alexandrian geographer, first used this name on a map. The mountains were thought to be the source of the Nile River. Indeed, melting snows from the range do feed some of the farthest Nile tributaries. The range is only 80 miles long but contains one of the most dramatic diversities of ecosystems in the world, for here within just a few miles from each other are the heat of tropical jungles and the cold of glacial ice. In fact, there are five distinct zones of habitation generating a world of amazing biodiversity. 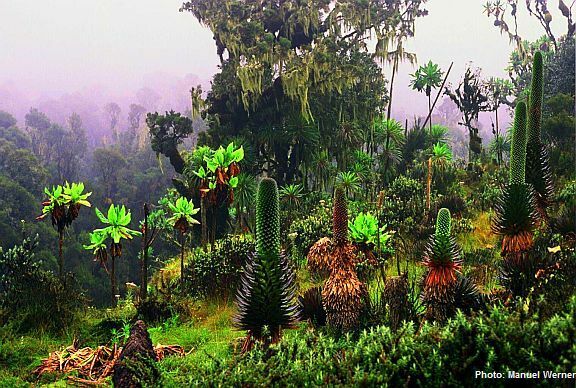 The range was named Rwenzori by European explorer Henry M. Stanley, after a native word meaning "rain maker." 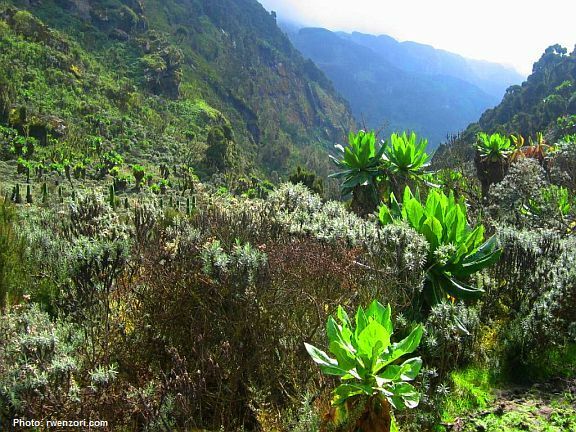 Indeed, the Rwenzori IS a rain maker, for up to 350 days a year rain falls on these mountains, feeding the dense foliage. At the base is the African SAVANNA teeming with animals including elephants and zebras. This zone is mostly between about 3,000 and 5,500 feet (914 - 1,676 m.). 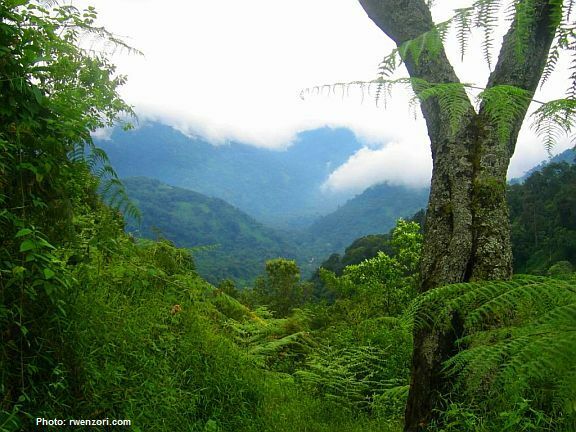 Above the grasslands is the RAINFOREST from 5,500 to 7,500 feet (1,676 - 2,286 m.). Here are giant ferns, wild banana trees and lianas. Above the jungle is the great BAMBOO forest, reaching up to around 9,500 feet (2,895 m.). Bamboo, a type of grass, can grow up to three feet a day here, and reach over a hundred feet in only two months! This forest type is one of the most unique habitats to walk through, in my opinion. OK, so above the bamboo is the HEATH zone. This zone extends up to around 12,000 feet (3,657 m.) or so, and is a land of dripping lichen-covered heather trees looming over a ground cover of mosses and liverwort. The trees, although 40 feet tall or so, are relatives of the low shrub growing in the Scottish moorlands. Going higher, we reach the ALPINE zone, above 12,000 feet (3,657 m.), a land which in its lower sections is dominated by giants. Here are plants unique only to the Afro-Alpine zone, including the tree groundsel and giant lobelia. The upper reaches of this zone, extending up to around 14,500 feet (4,419 m.), consist mostly of rocky terrain covered with black lichens and brown mosses. Finally, above 14,500 feet and reaching to Margherita Peak at 16,763 feet (5,109 m.) the highest point in the range, atop Mount Stanley, the Rwenzori mountains are wrapped in permanent snow and storm-swept glaciers. The first known ascent of the highest peak was made by Luigi di Savoia, the Duke of Abruzzi, accompanied by J. Petigax, C. Ollier and J. Brocherel, in 1906.